The time is getting near for Beth to retire. It won't be long before she will be eating cake and watching soapies every day! LOL Actually, it will be preparing more meals and watching her grandchildren! As her gift to you, she would like to have you stop in and get a FREE pattern she has made called - Beth's Last Hurrah! 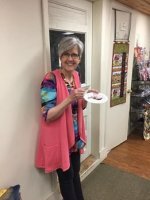 Her last day in the store will be Thursday, September 27 and she will be at our retreat on Friday, September 28 and Saturday, September 29. We have a new runner! Adorn your dining room or kitchen table with this fall festive tablerunner. It is very easy to make and the applique is fun too! Cost of the kit is just $19.99.